It’s the biggest shopping day of the year. There are tons of deals—and not-really-deals—out there. So we combed through every one we could find, and ranked them all. 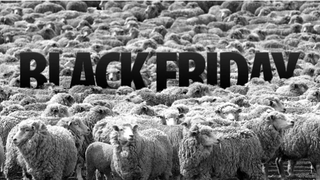 Here’s your Ultimate Black Friday guide: happy hunting. Deals are grouped by category, just like our daily Dealzmodo lists. So you’ll find ebook readers like the Kindle and Nook listed under Personal Portables and Peripherals, while the cheap Xbox 360/Kinect bundles are under Gaming. And this year, we even added a My Wishlist feature that lets you save your favorite deals in one place. Just click the + sign to the right of each item to add it to your wishlist. For online deals—like those at ThinkGeek, for example—you’ll be able to click through to the store. Otherwise, we’ve just collected and organized all of the flyers and circulars that you’d be thumbing through anyway. We’ll be updating this continuously throughout the next week, so make sure to keep checking back. Editor’s Note: This post contained scripts and formatting that are not supported by the current version of our CMS, Kinja, so they have been removed. We promise, the deals were really, really good, though.